I found this Handmade Dress Swap via a dressmaking Facebook group. I wasn’t too sure about whether I wanted to take part or not but at the very last minute I went for it! The concept was simple. You were partnered up with someone depending on your requirements that you put on your application form – things like if you could only post to someone in the same country, if you wanted to make something for someone of the same size as yourself etc. You could also put in any particular likes or dislikes you have for your own style – colours, length etc. I was partnered up with fellow Londoner Grace who had a pretty similar body shape to me. Her application form seemed super chilled and she seemed to like a more retro 50s full skirt vibe. I also stalked her plenty on Instagram to get a feel for her style! In the end, I went with the Butterick 6453 Gertie pattern that is ALL the rage right now which has a really retro vibe without being too explicitly vintage. I had already ordered that pattern and it arrived just after we got partnered up. It was fate! I chose a grey and white houndstooth cotton poplin to make the gathered skirt version of this dress. I felt the fabric was a bit more modern although when I looked at the final garment it came out more gingham-like than expected! I was really proud to be able to send this off! I didn’t know what to expect when I opened my dress but I was pleasantly surprised! Grace had made me a bat wing sleeved dress with a fitted skirt. The fit was spot on! I don’t think it’s necessarily something I would’ve picked out myself but I can definitely see myself wearing it. It’s more of a winter dress so I’ll be saving it to wear in a few months time for when the temperature drops. This was a really fun challenge and I’m really glad I participated! I’ll need to make sure I do it again (or others like it) in future! Thanks! It’s a bit daunting knowing someone else is checking your work! That being said the emphasis of the swap is to just appreciate whatever garment arrives at your doorstep rather than being super picky! Lol. You should definitely have a go next year! Lol. It’s such a good shape! I don’t know what the pattern is though so I can’t help further! What a cool swap! I would be so nervous to make something for another sewer–you and Grace both made beautiful dresses! I really love your dress on you, and think you should definitely rock it once the weather is suitable. Thanks! 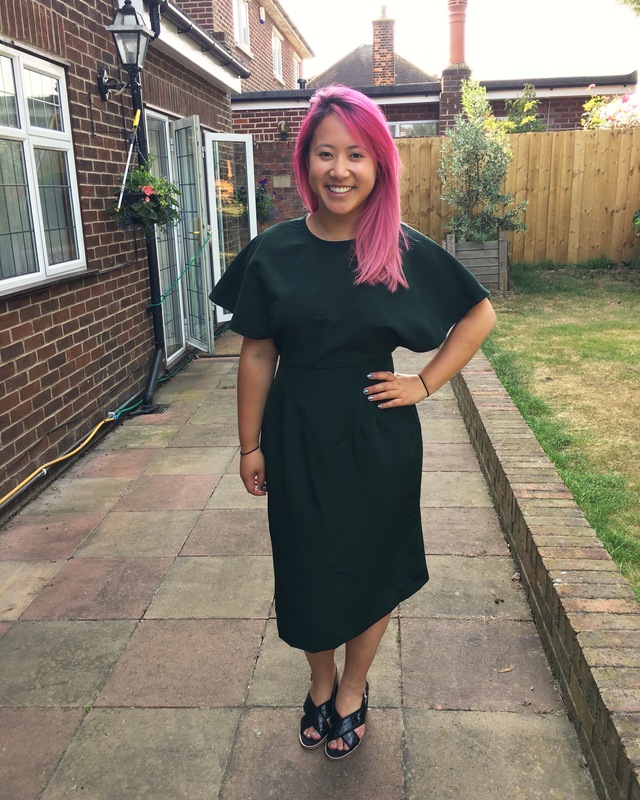 I’m so happy with how the swap turned out – I was properly second guessing my choices and so worried about the fit but it all worked out in the end! I love both dresses – very cute idea!